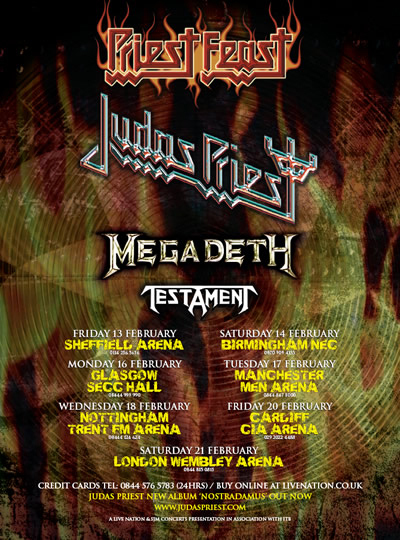 A French date has been announced for the "Priest Feast" tour featuring JUDAS PRIEST, MEGADETH and TESTAMENT. According to a posting on MEGADETH's web site, acclaimed British record producer/engineer Andy Sneap (MACHINE HEAD, NEVERMORE, EXODUS, ARCH ENEMY) arrived on September 28 to meet up with MEGADETH mainman Dave Mustaine and the crew at the band's new studio near San Diego, California. The studio is being custom-built to record the next MEGADETH album and more.